White Rose was a group of students and teachers from the University of Munich. Its core was made up of five students — Sophie Scholl, her brother Hans Scholl, Alex Schmorell, Willi Graf, and Christoph Probst, and a professor of philosophy, Kurt Huber. The group became known for an anonymous leaflet campaign, lasting from June 1942 until February 1943, which called for active opposition to Hitler. In January 1943, using a hand-operated duplicating machine, the group produced between 6,000 and 9,000 copies of their fifth leaflet, "Appeal to all Germans! ", which was distributed via courier runs to many cities, where they were then mailed. Written by Hans Scholl and Kurt Huber, the leaflet warned that Hitler was leading Germany into the abyss. The reader was urged to "Support the resistance movement!" in the struggle for "Freedom of speech, freedom of religion, and protection of the individual citizen from the arbitrary action of criminal dictator-states". These were the principles that would form "the foundations of the new Europe". The leaflets caused a sensation, and led to an intensive search for the authors by the Gestapo. In February 1943, the slogans "Freedom" and "Down with Hitler" appeared on the walls of the University and other buildings in Munich. Alexander Schmorell, Hans Scholl and Willi Graf had painted them with tar. The Scholls then dropped stacks of copies of their leaflets in the empty University corridors for students to find when they flooded out of lecture rooms. Finally they were seen and were arrested by the Gestapo. The other active members were soon arrested, and the group and everyone associated with them were interrogated. The Scholls and Probst were tried before the so-called People's Court that tried political offences against the Nazi State. They were found guilty of treason and were sentenced to death. Sophie, Hans and Christoph were executed by guillotine the same day. All three were noted for the courage with which they faced their deaths, particularly Sophie, who remained firm despite intense interrogation. Alexander Schmorell and Kurt Huber were beheaded in July and Willi Graf in October. Friends and colleagues of the White Rose, who helped in the preparation and distribution of leaflets and in collecting money for the widow and young children of Probst, were sentenced to prison terms ranging from six months to ten years. 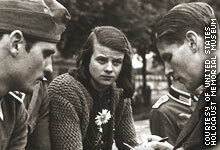 The last words of Sophie Scholl: "…your heads will fall as well". There is, however, some dispute over whether Sophie or Hans actually said this; other sources claim that Sophie's final words were "God, you are my refuge into eternity." The motto of the White Rose Society was: "We will not be silent. We are your bad conscience. The White Rose will not leave you in peace!"